My brief excursion to Berlin is at an end and I’m back in Brighton. 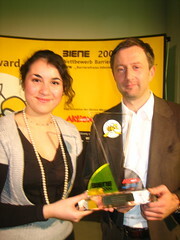 The prize-giving ceremony for the BIENE accessibility awards went well. It was a very professional affair in nifty surroundings. Champagne, canapés and short films from the folks at Ehrensenf made for a most pleasant awards ceremony. After the ceremony itself, a plentiful supply of food, beer and music ensured that the whole evening was enjoyable. The highly valued prizes went to some very deserving websites. I can vouch for the fact that the jury was pretty strict in its judgement. Even as the prizes were being handed out on stage, the sweet taste of victory was tempered by some words advising where improvements could still be made. Most of the winners sported valid markup; usually XHTML Transitional, sometimes even XHTML Strict. Quite a lot of the sites offered text-resizing facilities, though I wonder if that’s something best left to user agents. Joe will pleased to note that many of the sites also offered zoom layouts. The Pfizer website, winner of a golden Biene, includes a remarkable section that sets out to translate those bits of paper you get with your prescription into plain language… and sign language! The whole thing is done with Flash and it works wonderfully well with screenreaders. From a technical viewpoint, I’m really glad that I now have an example I can point to, should I ever find myself in one of those “Flash is inherently inaccessible” arguments. I also felt that it was very important that the prize-winning websites should be well-crafted with strong visual design. The Barmer website is not only accessible, it looks good too. It’s extremely bulletproof with a semi-liquid layout. There’s more semi-liquid goodness to be had at the site of the Bundesrat—the federal council of Germany. I’m really impressed with the clarity and cleanliness of the design. My personal favourite is the website of the Media Management department of the Wiesbaden Technical College. I like the nice clean design. They also offer material in plain language and sign language. It scales nicely, it’s usable and it’s accessible. But what impressed me most was the story behind the site. The website was created by students. A small group put the whole thing together in three months. They did this as just 12.5% of their coursework, so there was a ton of other work they needed to attend to at the same time. Under the guidance of professor Stephan Schwarz, they learned about structuring documents with markup and styling with CSS. The end result is something that would put many “professional” agencies to shame. What a debut! An accessible, good-looking site from people who have learned Web design the right way, without ever having to nest a table. I’m just blown away by their achievement. I requested, and was granted, the honour of awarding them their silver Biene on stage. That meant I had to speak German in front of a roomful of people (and television cameras) but I made it through without stumbling too much. At South by Southwest earlier this year, Andys Budd and Clarke gave a talk on Web Design Superheroes. The students from Fachhochschule Wiesbaden are my heroes. If they represent the next generation of designers, the Web is in very good hands indeed.